I can read hundreds of James Baldwin's sentences a hundred times, and the 66-word sentence above is one of them. His syntax often surprises and his meaning just as frequently suspends, occasionally dangles, and ultimately satisfies. Baldwin's longer sentences twist and turn, meandering toward a destination that will unsettle, agitate, and challenge, inspiring readers to simultaneously marvel at his syntactic and semantic intents. Whether we agree with his ideas is beside the point; what matters is how we emerge from absorbing them certain of his self-reflective, uncompromising honesty, which is an undeniably transcendent truth in its own right. Notice the last 6 of those 66 words: the mystery of the human being. What a way to capture our imagination by ending on the cryptic and keep us reading! 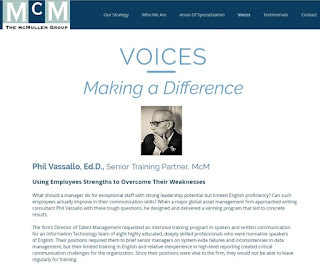 One of my recent training successes is featured in an article on the website of The McMullen Group, a burgeoning consulting firm. The post, "Using Employees Strengths to Overcome Their Weaknesses", summarizes my deeply customized training course for a major investment banking firm. The 12-week program was so successful that we repeated it four times. It's worth a read. A big thanks to Karen McMullen, Founder and Principal of the McMullen Group for the highlight! Writing in plain language requires the use of a simpler word and clearer sentence construction for maximum understanding by the intended audience. Using plain language matters to people who work in bureaucracies or other technically complex businesses if they want their readers to understand and act on their message. This practice is especially useful where the message needs translation into multiple languages; the simpler the word, the easier and more accurate the translation. Beginning with a post on the need for plain language and ending with one on word choice, I wrote a nine-part series on the topic that gained some attention. It's worth a look by searching "plain language" on this blog. 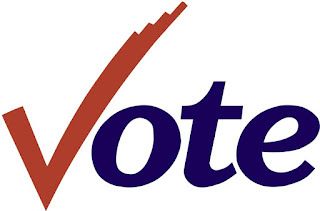 When it's time to vote, we might think of the slogans and sound bites of incumbents and challengers. It's time for doublespeak, the term coined by novelist George Orwell in his landmark book to mean language that pretends to communicate but really confuses. Numerous examples of doublespeak come to mind, but two resounding ones come to mind. The first is by former New York City Mayor Rudy Giuliani, for his infamous truth isn't truth comment in defending why President Donald Trump should not submit to testifying to the Mueller investigation team. The second is by New York State Governor Andrew Cuomo for calling "inartful" his statement "We're not going to make America great again—it was never that great" in response to President Trump's mantra. Keep seeking, dissecting, and reporting examples of doublespeak in the name of plain language. Our freedom of speech depends on it.